There is an interesting future Strange Horizons article to be written about the history of Doctor Who books, starting with the three 1960s publications, continuing through the series of novelisations of broadcast stories published by Target between 1973 and 1991, and then on to the more adult Virgin and later BBC and Telos books, coming back in the end to the current run of Ninth and Tenth Doctor books, which seem again to be aiming at a younger readership. In particular, the Target books were essential to the body of lore of Doctor Who fandom; they were the only resource we had to turn to for our collective memory, especially for those stories we missed the first time round due to being away that weekend or not being born yet. Certainly I was a regular borrower of the volumes from my local library, and later, they became a sink for pocket money. However, this is not that article. In this article, I examine the Doctor Who books of Ian Marter, who wrote more novelizations of broadcast stories than anyone except Terrance Dicks and, uniquely, came to the process not as a writer but as an actor. Target aimed to get the authors of the original television stories to do their own novelizations—not always possible, given the demands of other work, and not always desirable, given the different skills required. As a result, there were some writers who got the task of writing plenty of Doctor Who books. The most prolific of these was Dicks, who had been closely associated with the television series, most notably as script editor for the program during the five years when Jon Pertwee played the Third Doctor. . . .and again, there is another Strange Horizons article to be written contrasting Dicks's often formulaic approach to the novelizations with his capacity for originality displayed in some of the other spin-off fiction. Ian Marter, born in 1944, was a graduate of Oxford University and had worked as a stage manager at the Bristol Old Vic—supposedly the oldest continuously operating theatre in England—as well as having a supporting role in a 1973 Doctor Who story. Before Tom Baker was cast as the Fourth Doctor in 1974, it was expected that the new star of the show might be somewhat older—Pertwee had been in his fifties, as had the show's first star, William Hartnell, when he played the role—and that a male regular companion might be needed for action scenes. The role of Harry Sullivan, a British naval doctor attached to the United Nations Intelligence Taskforce (UNIT) was therefore created, and the part went to Marter. His slightly twittish but courageous character was well regarded by viewers as a foil for the new Doctor and established companion Sarah Jane Smith, played by Elisabeth Sladen. However, Tom Baker—who, at the age of forty, was the youngest Doctor so far—proved well able to cope with action scenes, so Harry Sullivan was written out after the first few stories, last appearing in December 1975. Over the following few months, Baker and Marter wrote a script together for a Doctor Who movie featuring the Doctor and a villain called Scratchman, who was to have been played by Vincent Price. But this project ran into the sand, Baker concentrated on his television role, and Marter moved to other projects. At this time, it could not be assumed that any particular Doctor Who story would eventually be available in written form. 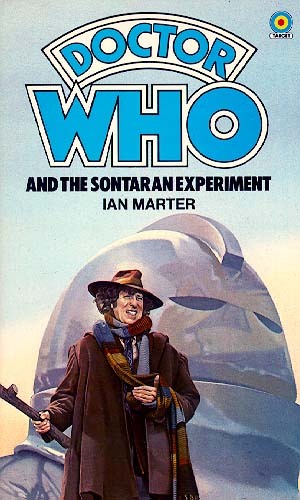 Marter's first book was only the sixth of the Tom Baker stories to be published (Terrance Dicks having written all but one of the other five). As noted above, Target started publication of Doctor Who novels in 1973, ten years after the first television broadcast, which aired the day after John F. Kennedy's assassination in November 1963. Target's rate of output was modest at first, 1973 seeing the reprinting of three stories first published in the 1960s, seven new novelizations appearing in 1974, another seven in 1975, and ten in 1976. 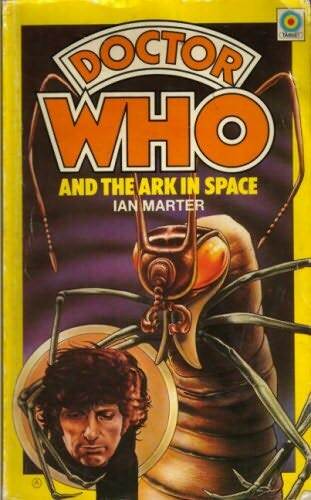 Marter's first two Doctor Who books, Doctor Who and the Ark in Space (1977) and Doctor Who and the Sontaran Experiment (1978), were both based on stories broadcast in 1975 in which Marter himself had appeared as Harry, and there's a corresponding emphasis on the character. It is weaker in the former, a story of alien insects infiltrating a far-future space station where humanity lies dormant, waiting for the earth to become inhabitable again, although Harry very much provides the viewpoint in the first chapter as we are introduced to the Doctor, Sarah, and the futuristic setting. It's more prevalent in the latter, following directly after The Ark in Space in broadcast order, where the Doctor and friends spoil the plans of the eponymous aliens to invade the Earth. The very first Doctor Who novel published, David Whitaker's Doctor Who in An Exciting Adventure with the Daleks (1964), had told the story in first-person from the viewpoint of the First Doctor's companion Ian Chesterton. This was in the days when it was not expected that anyone would ever see the Daleks again, and so it was easier to play around with the format for what was expected to be a stand-alone book with no other surviving media backing it. By the late 1970s, however, repeats in the summer had become normal procedure, so the novels had necessarily to stick more closely to the original broadcast version. In any case, it would be very difficult to write any Doctor Who novel from a first-person point of view; television requires multiple viewpoints, and restricting it to a single character means all kinds of narrative gyrations, as even Whitaker found in 1964, despite having a freer hand. If Marter was tempted to write these two from his own character's viewpoint, he was wise to restrain himself. Marter both added and subtracted from the story as broadcast. He removed, somewhat surprisingly, most of the humorous lines of dialog, such as the Doctor's line from The Ark in Space : "Well, my doctorate is purely honorary, and Harry here is only qualified to work on sailors." It is, of course, a joke on Harry's character, but perhaps Marter just felt the line didn't work as well on the page as it does on the screen. It's also a bit surprising that the unusual link between the two television stories—the Doctor and his companions travel to Earth via transmat beam—was dropped in favour of the more standard journey in the Doctor's TARDIS. He added, however, some simply superb descriptive passages which one really regrets were not realised on-screen. Sometimes it's just little things, like the Doctor opening a door on the space station by thinking at it. At his best, there are some much longer sections: Harry gets almost an entire chapter to himself exploring the Sontaran spaceship, a passage completely absent from the television story, which had only two episodes as opposed to The Ark in Space 's four, so some padding was required. There's also Sarah's journey through the ventilation duct, through the mass of Wirrrn—another thing added by Marter is an extra "r" in the name of the monster insects—and the nightmares inflicted on both Sarah and Harry by the Sontaran experimenter. He also adds graphical nastiness and violence. One character's head explodes, revealing the Wirrrn within. Another's body is "burnt to a colourless crystal." The fight between the Sontaran and the Doctor is realised in considerable detail. Basically, if your attention is suddenly held by the prose in one of Marter's novelizations, it's a fair bet that it's something he added. Doctor Who and the Sontaran Experiment makes a below-average DW story into a well-above-average DW novel. Doctor Who and the Ark in Space is a really good read, to the point where Andrew Wrixon at the Doctor Who Ratings Guide blames Marter for making him unable to enjoy the original television version as much as he does the novel. 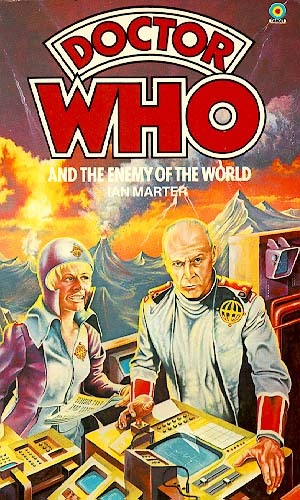 The Sontaran Experiment was the last story featuring Marter on screen to appear in print—apart from The Ark in Space , the others were all written up by the inevitable Terrance Dicks—and he went on to write seven more novelizations for Target, both catching up from the earlier Doctor Who stories shown before Target started publishing the novelizations and keeping up with the most recent broadcasts. Alas, Marter's next four books were much less impressive efforts than his first two. The standard Target novelization (i.e., by Dicks) just ran through the script in 120 or so pages with a bit of extra description, and Marter did not venture very far beyond that model in what might be called his middle period. 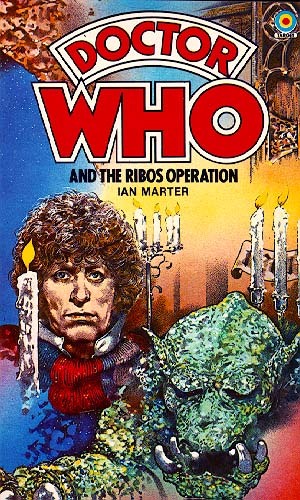 The Ribos Operation was the first in the 1978-79 season of six stories about the Doctor's quest to reassemble the Key to Time, and introduced fellow Time Lord Romana as the Fourth Doctor's new companion. Marter's 1979 novelization rather lacks the television version's abiding sense of cold; the setting is a snowy city on a chilly, medieval planet. The initial set-up between the Doctor and Romana is changed substantially, and not for the better; Marter's version has her arrival as a total surprise, unlike the broadcast version where the Doctor is forewarned, and puts the two characters on a more equal footing, but somehow doesn't sparkle the same way as the broadcast version's clash of egos between Baker's Doctor and Mary Tamm's Romana. The final battle is indeed much more gory in the book, but that's to be expected from a Marter novel. The Enemy of the World was the one story of the Second Doctor's famously monster-filled 1967-68 season that did not feature monsters, instead pitting the Doctor and companions Jamie and Victoria against a would-be dictator of near-future Earth who happens to be the Doctor's exact double. This was nonetheless published rather early for a Second Doctor story, in 1981—the sixth of Patrick Troughton's twenty-one stories to become available in hard copy. This was the first time Marter had tried to squeeze a six-episode story into 127 pages, so obviously some cuts were necessary, but the result feels very jumpy, and the book does not really add to the story, which itself is not highly regarded among fans. The various deaths by shooting are, of course, more gory than on screen; the funniest dialogue from the screen is, of course, cut by Marter from the novelization. It does have a rather striking cover, though. 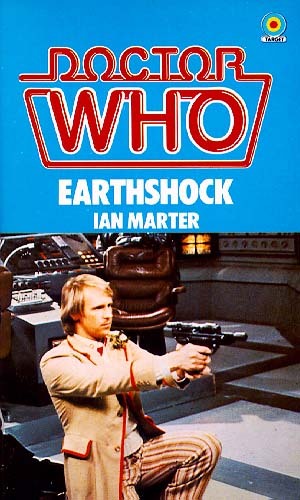 The 1982 Fifth Doctor story Earthshock famously, shockingly, killed off the Doctor's companion Adric in battle with the Cybermen. While the descriptions in early chapters of people being melted into puddles of liquid by androids seem like yet another gruesome addition of detail by Marter, in fact for once his novelization, published in 1983, stuck pretty closely to the original broadcast version—indeed more so than for any of his other novelizations. Unfortunately this does also emphasise the numerous flaws in the plot—not, of course, Marter's fault but among many crimes which must be laid at the door of the television script's author, Eric Saward. Why are the Cybermen hiding on the spaceship? Why aren't their weapons as good as their androids'? How did they get the bomb onto Earth in the first place? Faced with this material, Marter did a barely adequate job of the novelization. Doctor Who—The Dominators (1984) is a better book, but this is not saying much. It is based on a very over-padded five-episode story, the first in Troughton's final (1968-69) season as the Second Doctor, with companions Jamie and Zoe helping to ward off the invasion of the peace-loving planet of Dulkis by the eponymous Dominators. Marter has made it a bit less dull and injected some of the missing chemistry between the two Dominators themselves . . . and made them both over two and a half metres tall! He does capture Zoe and Jamie rather well here, the latter better than in Doctor Who and the Enemy of the World . But again, faced with such unpromising material to work from, the result is rather uninspiring. Somehow Marter managed to find his creative spark for his last three novelizations, which are all cracking good reads. 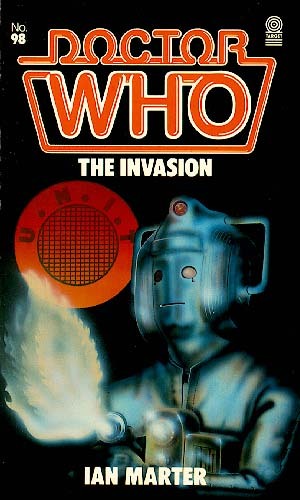 The Invasion , also from the 1968-69 season, also featured Jamie and Zoe, and concerned Cybermen invading a near-contemporary London; it also brought back the character of Alastair Gordon Lethbridge-Stewart as the Brigadier in charge of UNIT. This was an eight-part story when first broadcast, cut down for Marter's 1985 novel to 160 pages, so a rather extreme compression. But somehow, Marter makes it work as he failed to with his previous Second Doctor stories; he had better material to start with, true, but the plot is somewhat easier to follow in his novel than in Derrick Sherwin and Kit Pedler's original script. The villainous Tobias Vaughn, briliantly brought to life by Kevin Stoney on screen, is actually better in some ways here, with several hints that he has already become more—or perhaps less—than completely human, and his change of heart at the end of the story, when he turns on his Cyberman former allies, more consistently portrayed as a fanatic changing targets rather than as the human being brought to his senses whom we saw on television. At the same time, no written description can possibly convey Stoney's sinister drawl, now available to all on a recently released DVD. There is also, unusually, an injection rather than a subtraction of humour by Marter, with a running joke about the awful tea in UNIT headquarters. 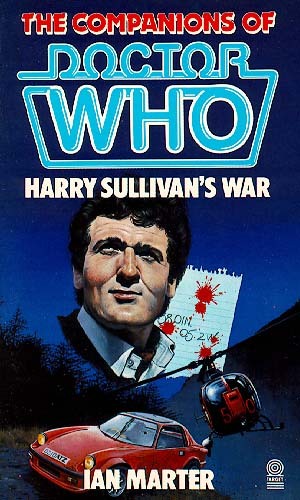 But here we must take a break for Marter's 1986 novel taking his broadcast character ten years forward, Doctor Who—Harry Sullivan's War , as it is on the spine, or The Companions of Doctor Who: Harry Sullivan's War , as the front cover has it, or just plain Harry Sullivan's War , as it is on the title page. 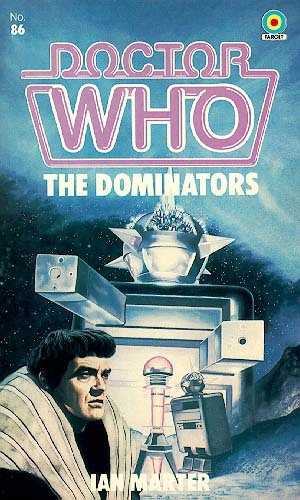 This was the second officially published Doctor Who spin-off novelization not based on a television story—the first being the long-forgotten Turlough and the Earthlink Dilemma , published earlier the same year—and so could be said to be at the start of the long chain of spin-off fiction passing through the Virgin New and Missing Adventures to the BBC Eighth Doctor, Past Doctor and New Doctor Adventures, but also including the Big Finish audios and climaxing, if that is the word, in the 2006 television series Torchwood . Alas, we start to understand why Marter was never otherwise able to sell original fiction. It was startling to learn on page four that, in this book meant to have a contemporary mid-1980s setting, NATO headquarters is located in Geneva—a fairly trivial detail to readers who do not have my professional interest in either NATO or Geneva, but symptomatic of a lack of focus throughout. Harry Sullivan, meant to be an experienced military doctor working on top-secret biological warfare, seems to have no idea about elementary security precautions. There are cameos from the Brigadier (now retired) and Sarah Jane Smith, and some nice bits with a recurrent Van Gogh motif, with a climactic fight on the Eiffel Tower, but basically, it doesn't make much sense. Forward—or, in some ways, back—to the really good stuff now. 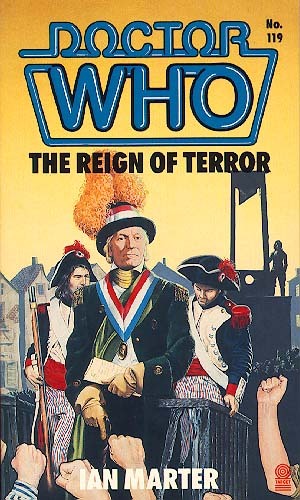 Marter's last two books, Doctor Who—The Reign of Terror (1987) and Doctor Who—The Rescue (1988), equal and surpass his best earlier ones, in somewhat different ways. Both feature William Hartnell's First Doctor, and both were published over twenty years after the stories were first broadcast but long before either was commercially available on video, so were both effectively the most canonical versions of the stories accessible to fandom. The Reign of Terror was the six-part story which ended the very first season of Doctor Who back in 1964. It features some gruesome implied violence, which Marter was uncharacteristically subdued in writing up, apart from the historically accurate detail of Robespierre having his jaw blown off just before the end of the story. The whole atmosphere of a Paris living under horrible oppression is well conveyed; as with any Doctor Who story, the main characters get split up to follow different bits of the action, but Marter conveys very well their panic and disorientation in this dangerous environment, as he failed to do in Doctor Who—The Dominators . Purists will feel robbed that the Doctor's rather charming speech about destiny at the end of the last scene has been replaced with some banter between him and Ian Chesterton, but it really is one of those cases where what worked on the screen would not have worked so well on the page. It also has absolutely the best cover of the ten books. 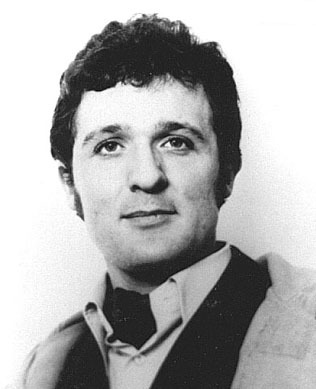 Ian Marter died suddenly on his 42nd birthday, 28 October 1986, having completed and partially revised Doctor Who—The Rescue . His last is probably his best book. The Rescue was a rare two-part story, broadcast in 1965, intended purely to introduce the first new companion to join the show since its beginning: Vicki—one of two survivors of a spaceship crash on an apparently hostile planet, though one which the Doctor claims to have visited before, in an untelevised adventure. For once, the printed page is superior to the screen. Maureen O'Brien, aged 21, could never really pass as the young teenager that Vicki was meant to be; Marter is not restricted by the actor's appearance. The monsters of the planet were among the least compelling aspects of the original television story; again, Marter can just make them up and indeed actually brings in more. We get loads more banter between the Doctor and Ian, with Marter putting comic dialogue in rather than taking it out. And the entire story is topped and tailed by reports from the rescue ship which is supposed to be coming for Vicki and her fellow-survivor, so that one feels that this planet is one that fits into a wider history. So, who knows what Marter might have delivered had he lived? Certainly some more novelizations—there were still a couple of dozen left when he died. Perhaps Peter Darvill-Evans and Rebecca Levene might have knocked him into shape as a contributor to the Virgin series. Perhaps, like Noel Clarke who played Rose's boyfriend Mickey in the 2005 and 2006 series of Doctor Who , and went on to write an episode of Torchwood , he would have been a contributor to the New Who phenomenon. Going by what we have, the quality would have been uneven, but at his best, Marter was very good. Sadly, we'll never know. Resources for such a study can be found in Tim Neal's On Target site and Sarah Hadley's Target Practice site. His other published fiction included the book-of-the-film of Down and Out in Beverley Hills , and as Ian Don the books-of-the-films of Baby , Splash , My Science Project , and Tough Guys . It may not be a tragedy that the four books he apparently wrote about the Gummi Bears were never published. 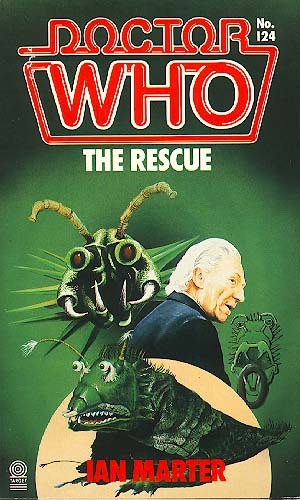 We should also note that several of the episodes here discussed—two of six in The Reign of Terror , two of eight in The Invasion , five of six in The Enemy of the World , and sadly none of The Dominators —were wiped by the BBC in the process of tidying up their archives, so survive only as soundtrack and as Marter's novelizations. Nicholas Whyte (email Nicholas) works in international politics in Brussels, Belgium, and is an unashamed Doctor Who fan.